We are back in DC at Utility Dive’s offices for a one-day workshop covering how clean energy is impacting the electric utility industry. Don’t worry, it’ll be fun! When it’s over, you’ll understand the difference between clean, green, renewable, as well as advanced energy choices; how the electric grid functions and how grid operators are handling greater penetrations of renewable energy; why utility regulation models may not encourage change; how solar changed everything; the challenges and promises of electrifying the transportation industry and so much more! Throughout the day we will simplify the overly complex industry jargon and help you gain better insights into the changes, challenges, and opportunities for you in today’s new energy marketplace. Ask questions along the way…it’s worth a day of your time. If you are new to the industry or you communicate, do business development or marketing, finance, legal, or IT around the electric utility industry for suppliers, utilities, clean energy companies, new service companies, associations, or policy makers, this is the program for you to get a strong grasp of the whole picture and your opportunities in an enjoyable, interactive workshop setting. “By operating at powers of up to 350 kilowatts, the newest model from ABB, Terra High Power charger, adds up to 200 kilometers of range to an electric vehicle in just 8 minutes,” said ABB in a statement released. This is said to add seven times more range in the same time than current models on the market. Utility monopolies keep their power by keeping elected officials in their pockets. It’s time we fight back! Enough is enough! We can no longer tolerate our elected officials supporting utilities who deny us our rights. To maintain independence from monopoly utility interests and to avoid the perception of undue influence on my positions concerning state energy policies, I will take no campaign contributions from utility corporations, their Political Action Committees, lobbyists and executives. Want to help spread the word? Click here to print out a pledge for your local candidates to sign. Scan it or take a picture and email it to us at: pledge@solarunitedneighbors.org. An Energy and Policy Institute analysis of the Republican Governors Association, Republican Attorneys General Association, Republican State Leadership Committee, Democratic Governors Association, Democratic Attorneys General Association, and Democratic Legislative Campaign Committee found over 70 utility holding companies and subsidiaries contributing to anti-solar lobbying groups for a total of $36.4 million from 2008 through 2017. An Energy Policy Institute analysis of spending by Florida utilities Duke Energy and Florida Power and Light. Rooftop Solar Dims Under Pressure From Utility Lobbyists – The New York Times reports on efforts by utilities to slow the development of rooftop solar. 1. Source: Center for Responsive Politics; www.opensecrets.org. To find out if state candidates and elected officials in your area are taking money from utility interests, go to www.followthemoney.org. The District has an ambitious plan to cut electric bills in half for low- and moderate-income residents while making solar accessible to everyone. We’ll take a deep dive into the #Solar4AllDC program’s past, present, and future with Nora Hawkins from Department of Energy & Environment and Jacqueline Brown, the first qualified #Solar4AllDC grant recipient in our 51st State Solar Co-op! The District has an ambitious plan to cut electric bills in half for low- and moderate-income residents while making solar accessible to everyone. We'll take a deep dive into the #Solar4AllDC program's past, present, and future with Nora Hawkins from Department of Energy & Environment and Jacqueline Brown, the first qualified #Solar4AllDC grant recipient in our 51st State Solar Co-op! Solar power brings economic benefits to those who can participate, but it also does much more. Our first panel of the day is titled “Solar Energy, Equity, and Health” and features Yinka N. Bode-George from Maryland Environmental Health Network, Edward Yim from Department of Energy & Environment, Denise Fairchild from Emerald Cities Collaborative, and Ron Bethea from Positive Change Purchasing Co-operative LLC to explore these diverse community benefits! Solar power brings economic benefits to those who can participate, but it also does much more. Our first panel of the day is titled "Solar Energy, Equity, and Health" and features Yinka N. Bode-George from Maryland Environmental Health Network, Edward Yim from Department of Energy & Environment, Denise Fairchild from Emerald Cities Collaborative, and Ron Bethea from Positive Change Purchasing Co-operative LLC to explore these diverse community benefits! The New York Power Authority and other state agencies have asked New York regulators to make changes to the rate structures of public electric vehicle DC fast charging stations to eliminate demand charges aimed at developing these stations. According to NYPA, the stations’ low utilization rates combined with the use of demand charges “renders any business model for DCFCs infeasible.” Other state agencies joining NYPA on the proposal are: the New York State Department of Environmental Conservation; New York State Department of Transportation; and the New York State Thruway Authority. The New York agencies have also asked the Public Service Commission to direct direct utilities to develop broad plans to encourage the adoption of electric vehicles, similar to proceedings opened in Oregon and California. New York is aiming to have 800,000 electric vehicles on its roads by 2025. 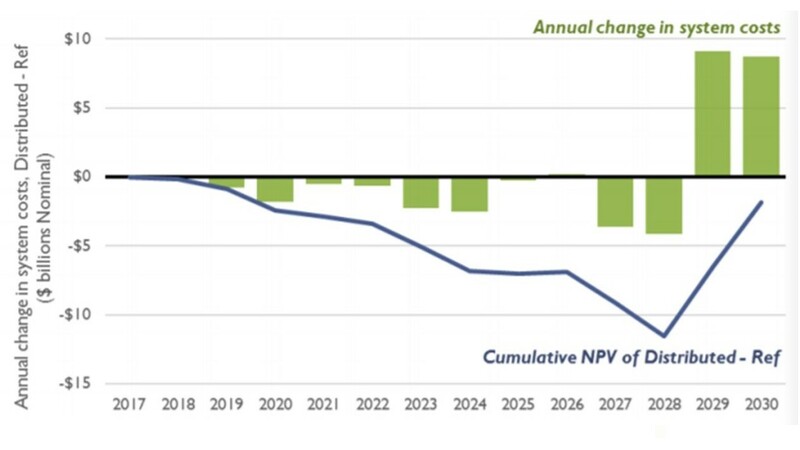 But with seven years left, the state has a ways to go with this year a “crucial inflection point,” NYPA told the Public Service Commission. At the end of November 2017, cumulative zero emission vehicles sold in New York was just over 30,000. In order for adoption to accelerate, the state must address consumers range anxiety; the proliferation of DC fast charging stations, which allow for rapid charging, is one way. Last year, Rocky Mountain Institute published research that concluded public chargers and demand charges simply didn’t work together. Duke Energy scored a pair of wins in North Carolina, agreeing to a relatively mild fine for coal ash contamination while also convincing regulators to approve the utility’s $62 million solar rebate program. It’s a financial mixed bag for Duke, particularly in Kentucky where regulators say they “substantially reduced” the utility’s rate increase, ultimately approving just 28% of the request. In North Carolina, however, regulators supported Duke’s solar rebate program, under which residential customers will be eligible for a rebate of $0.60/watt for solar energy systems 10 kW or smaller. The program is required under a law the state passed last year. The utility says agreeing to the fines means it can begin to move forward with the cleanup of the sites. In February, the North Carolina Utilities Commission allowed Duke Energy Progress to raise customers’ fixed monthly charges by 25% and granted the utility rate increase of $232 million to pay for coal ash cleanups. If FirstEnergy Solutions and Exelon follow through on plans to close a total of four nuclear power plants in Ohio and Pennsylvania, it would harm the environment and result in significantly higher electricity prices for consumers, according to a report by The Brattle Group. The closures would likely result in an annual increase of more than 20 million metric tons of carbon dioxide emissions and tens of thousands of tons of incremental air pollutants, according to the report, which Brattle prepared for the advocacy group Nuclear Matters. The closures would also increase annual electricity costs by as much as $400 million annually for Ohio residents and $285 million for Pennsylvanians, the report found. FirstEnergy Solutions (FES) has become the latest lightning rod in the battle over nuclear power subsidies. The FirstEnergy subsidiary has been lobbying for some form of support for its nuclear plants for years. States such as Illinois, New York, Connecticut and, most recently, New Jersey all have passed some form of zero emission credit (ZEC) subsidy program that pays nuclear generators for their emissions-free electricity. But FES has not had success in Ohio and Pennsylvania, where its nuclear plants operate, and is now trying to win support from the Department of Energy under section 202c, a little used provision of the Federal Power Act. Section 202c orders are designed to keep plants running after natural disasters or other unexpected grid conditions. In the wake of its request to the DOE, FES also filed for Chapter 11 bankruptcy court protection. The economically challenged nuclear plants account for about 6% of the electricity generated by FES. Absent some form of subsidy FES said it plans to close its 908 MW Davis-Besse nuclear plant in Oak Harbor, Ohio, in 2020; its 1,268 MW Perry nuclear station in Perry, Ohio, in 2021; and its 1,872 MW Beaver Valley station in Shippingport, Pa., in 2021. In the report, Brattle analysts Mark Berkman and Dean Murphy said the closure of the nuclear plants would reverse the environmental benefits of all the wind and solar resources developed in the PJM Interconnection region over the past 25 years. At the current growth rate of renewable resources, it would take another 15 years to replace the zero emission output of the four nuclear plants, the analysts calculate. In addition, Berkman and Murphy estimate that removing the nuclear plants from the market would raise power prices in Ohio by up to $2.43/MWh and in Pennsylvania by up to $1.77/MWh. Their estimates of cost impacts do not take into account the potential costs to consumers of a potential nuclear subsidy. “I’m not aware of an explicit proposal, so I don’t know what the ZEC cost would be,” Murphy said in an email to Utility Dive. “The electricity price effect and resulting customer savings from keeping the plants that we report is [the] gross [amount]; you would need to deduct ZEC cost from this to see the net cost effect on customers,” he wrote. Under Illinois’ ZEC program, two Exelon nuclear plants will receive customer-funded payments of $235 million a year for 10 years. Meanwhile, the American Petroleum Institute on April 13 sent a letter to President Donald Trump urging opposition to the use of section 202c to support nuclear plants. Granting such a request “would be at odds with your stated goals of energy dominance, economic growth, and improving America’s infrastructure,” Jack Gerard, API president and CEO, said in the letter. Granting emergency relief to the nuclear plants would undermine the operation of competitive markets, he said. In a rare alignment of interests, the Sierra Club is taking the same side in this battle as API. In late March Mary Anne Hitt, director of Sierra Club’s Beyond Coal campaign, said that the environmental group would “challenge and defeat the administration in court,” if it were to bailout FES’ nuclear plants. Alabama has a Community Power score of 2 out of 36. The state allows communities to provide energy financing to commercial properties with property assessed clean energy, but lacks any other significant policy to support local renewable energy development, including net metering, shared renewables (e.g. community solar), simplified grid interconnection policies, requirements for utilities to purchase distributed renewable energy resources, or opportunities for communities to pick their power supplier. Alaska has a Community Power score of 6 out of 36. Although the state has a net metering policy and allows communities to set building energy codes, it lacks a wide range of policies to support distributed renewable energy and local authority. Arizona has a Community Power score of 11 out of 36. The state offers net metering and requires utilities’ renewable energy procurement to include distributed resources, and also allows cities to set building energy codes. It doesn’t allow communities to provide financing with property assessed clean energy, to pick their energy suppliers, or encourage shared/community renewables. The state’s grid interconnection policies also hinder distributed energy resources like rooftop solar. Arkansas has a Community Power score of 8 out of 36. Although the state has a net metering policy that allows customers to reduce energy costs against all their meters and allows communities to provide energy financing to commercial properties with property assessed clean energy, Arkansas doesn’t allow communities to set stretch building energy codes or pick energy suppliers. The state doesn’t require utilities to develop distributed renewable energy resources, has poor interconnection policies that hinder connection of distributed energy resources like solar, and has no policy supporting shared or community renewable energy projects. California has a Community Power score of 27 out of 36. The state has many policies encouraging local power, including net metering and simplified interconnection to encourage distributed energy resources like solar. It also allows shared/community renewable energy, communities to pick their energy suppliers, and allows communities to provide financing to residential and commercial properties with property assessed clean energy. California is one of a few states to provide a standard offer contract for distributed energy across the state. The state only lags in requiring utility renewable energy procurement to include distributed resources and in lacking a stretch building energy code for cities to go further than the state standard. Colorado has a Community Power score of 21 out of 36. The state has several policies encouraging local power, including net metering (and aggregate net metering) and above average grid interconnection rules, a renewable standard requiring utility renewable energy procurement to include distributed resources, a shared/community renewable energy law, and it allows communities to provide financing to commercial properties with property assessed clean energy. Colorado also allows cities to set building energy codes. Colorado lacks a policy to allow communities to pick their energy supplier or a standard purchase contract for renewables. Connecticut has a Community Power score of 15 out of 36. The state has a few policies encouraging local power, including net metering and above average grid interconnection rules, a renewable standard requiring utility renewable energy procurement to include distributed resources, and rules allowing communities to provide financing to commercial properties with property assessed clean energy. The state lacks local flexibility to set higher building energy codes, a policy to allow communities to pick their energy supplier, or a standard purchase contract for renewables. The District of Columbia has a Community Power score of 22 out of 36. The state has several policies encouraging local power, including net metering and above average grid interconnection rules, a renewable standard requiring utility renewable energy procurement to include distributed resources, rules allowing communities to provide financing to commercial properties with property assessed clean energy, and a shared renewables or community solar program. Because it’s both city and “state,” the District also scores highly for setting its own building energy code. The District lacks community choice energy that would enable the city government to opt out of service from the incumbent investor-owned utility, PEPCO, as well as lacking a standard purchase contract for renewables. Delaware has a Community Power score of 13 out of 36. The state has a few policies encouraging local power, including net metering allowing meter aggregation and above average grid interconnection rules, and a renewable standard requiring utility renewable energy procurement to include distributed resources. The state lacks local flexibility to set higher building energy codes, to use property tax bills to finance clean energy, a policy to allow communities to pick their energy supplier, shared renewable energy (like community solar), or a standard purchase contract for renewables. Florida has a Community Power score of 10 out of 36. The state has just two policies encouraging local power, including net metering and allowing communities to provide financing to residential and commercial properties with property assessed clean energy. However, it’s grid interconnection rules are below average and the state lacks a renewable standard requiring utility renewable energy procurement to include distributed resources, local flexibility to set higher building energy codes, a policy to allow communities to pick their energy supplier, shared renewable energy (like community solar) or a standard purchase contract for renewables. Georgia has a Community Power score of 9 out of 36. The state has just two policies encouraging local power, including net metering and allowing communities to provide financing to residential and commercial properties with property assessed clean energy. However, it’s grid interconnection rules are abysmal and the state lacks a renewable standard requiring utility renewable energy procurement to include distributed resources, local flexibility to set higher building energy codes, a policy to allow communities to pick their energy supplier, shared renewable energy (like community solar) or a standard purchase contract for renewables. Hawaii has a Community Power score of 19 out of 36. The state has several policies encouraging local power, including net metering and above average grid interconnection rules, a shared/community renewable energy law, a standard purchase contract for renewables, and it allows communities to provide financing to residential and commercial properties with property assessed clean energy. Hawaii lacks a renewable standard requiring utility renewable energy procurement to include distributed resources, a policy to allow communities to pick their energy supplier, or local flexibility in setting building energy codes. Idaho has a Community Power score of 5 out of 36. The state offers net metering with meter aggregation, but little else. It doesn’t have a renewable standard requiring utility renewable energy procurement to include distributed resources and it lacks policies allowing communities to provide financing with property assessed clean energy, to pick their energy suppliers, or encourage shared/community renewables. It also lacks local flexibility in setting building energy codes or a standard purchase contract for renewables. Idaho also has abysmal interconnection policies for distributed energy like rooftop solar. Illinois has a Community Power score of 26 out of 36. The state has many policies encouraging local power, including net metering and simplified interconnection to encourage distributed energy resources like solar, as well as requiring utility renewable energy procurement to include distributed resources. It also allows shared/community renewable energy, communities to pick their energy suppliers, and allows communities to provide financing to commercial properties with property assessed clean energy. Illinois doesn’t allow aggregate net metering or offer a standard contract for distributed renewable energy projects or a stretch building energy code for cities to go further than the state standard. Iowa has a Community Power score of 7 out of 36. The state offers net metering and has above average interconnection policies, but little else. It doesn’t have a renewable standard requiring utility renewable energy procurement to include distributed resources and it lacks policies allowing communities to provide financing with property assessed clean energy, to pick their energy suppliers, or encourage shared/community renewables. It also lacks local flexibility in setting building energy codes or a standard purchase contract for renewables. Kansas has a Community Power score of 6 out of 36. The state offers net metering and provides local flexibility in setting building energy codes, but little else. The state doesn’t have a renewable standard requiring utility renewable energy procurement to include distributed resources and it lacks policies allowing communities to provide energy financing with property assessed clean energy, to pick their energy suppliers, or encourage shared/community renewables. Kansas also lacks a standard purchase contract for renewables and has abysmal interconnection policies for distributed energy like rooftop solar. Kentucky has a Community Power score of 8 out of 36. The state offers net metering and allows communities to provide energy financing for commercial properties with property assessed clean energy, but little else. The state doesn’t have a renewable standard requiring utility renewable energy procurement to include distributed resources, or laws letting cities pick their energy suppliers, or encouraging shared/community renewables. Kentucky also lacks a standard purchase contract for renewables, local flexibility in setting building energy codes, and has below average interconnection policies for distributed energy like rooftop solar. Louisiana has a Community Power score of 7 out of 36. The state offers net metering and allows communities to provide energy financing for commercial properties with property assessed clean energy, but little else. The state doesn’t have a renewable standard requiring utility renewable energy procurement to include distributed resources, or laws letting cities pick their energy suppliers, or encouraging shared/community renewables. Louisiana also lacks a standard purchase contract for renewables, local flexibility in setting building energy codes, and has abysmal interconnection policies for distributed energy like rooftop solar. Maine has a Community Power score of 12 out of 36. The state has a few policies encouraging local power, including net metering and above average grid interconnection rules, a shared renewables program, and local flexibility in setting building energy codes. Maine lacks a renewable standard requiring utility renewable energy procurement to include distributed resources, community choice energy that allows communities to choose their energy supplier, a standard purchase contract for renewables, or rules allowing communities to provide energy financing with property assessed clean energy. Maryland has a Community Power score of 18 out of 36. The state has several policies encouraging local power, including net metering and above average grid interconnection rules, a renewable standard requiring utility renewable energy procurement to include distributed resources, a shared renewables (community solar) program, and rules allowing communities to provide financing to commercial properties with property assessed clean energy. Maryland lacks community choice energy that allows communities to choose their energy supplier, a standard purchase contract for renewables, and local flexibility in setting building energy codes. Massachusetts has a Community Power score of 30 out of 36. The state has many policies encouraging local power, including net metering and simplified interconnection to encourage distributed energy resources like solar, as well as requiring utility renewable energy procurement to include distributed resources. It also allows shared/community renewable energy, communities to pick their energy suppliers, and allows communities to provide financing to commercial properties with property assessed clean energy. Massachusetts is also one of just two states to set a state building energy code with a standard “stretch” code for communities to go further than the state standard. The state only lacks a standard contract for distributed renewable energy projects, residential PACE, and aggregate net metering. Michigan has a Community Power score of 14 out of 36. The state has a few policies encouraging local power, including net metering, a renewable standard requiring utility renewable energy procurement to include distributed resources, and it allows communities to provide financing to commercial properties with property assessed clean energy. Michigan lacks community choice energy that allows communities to choose their energy supplier, a standard purchase contract for renewables, a shared renewables program, or local flexibility in setting building energy codes. Minnesota has a Community Power score of 18 out of 36. The state has a few policies encouraging local power, including net metering with meter aggregation, a renewable standard requiring utility renewable energy procurement to include distributed resources, a shared renewables (community solar) program, and it allows communities to provide financing to commercial properties with property assessed clean energy. Minnesota lacks community choice energy that allows communities to choose their energy supplier, a standard purchase contract for renewables, or local flexibility in setting building energy codes. It has average interconnection rules for distributed energy like rooftop solar. Mississippi has a Community Power score of 7 out of 36. The state offers net metering and has above average interconnection rules for distributed energy like rooftop solar, but that’s it. The state doesn’t have a renewable standard requiring utility renewable energy procurement to include distributed resources, or laws letting cities pick their energy suppliers, or rules allowing shared/community renewables. Mississippi also lacks a standard purchase contract for renewables and local flexibility to offer energy financing via property taxes or in setting building energy codes. Missouri has a Community Power score of 14 out of 36. The state has a few policies encouraging local power, including net metering, a renewable standard requiring utility renewable energy procurement to include distributed resources, it allows communities to provide financing to commercial properties with property assessed clean energy, and it provides local flexibility in setting building energy codes. Missouri lacks community choice energy that allows communities to choose their energy supplier, a standard purchase contract for renewables, or a shared renewables (or community solar) program. It has abysmal interconnection rules for distributed energy like rooftop solar. Montana has a Community Power score of 6 out of 36. The state offers net metering and has average interconnection rules for distributed energy like rooftop solar, but that’s it. The state doesn’t have a renewable standard requiring utility renewable energy procurement to include distributed resources, or laws letting cities pick their energy suppliers, or rules allowing shared/community renewables. Montana also lacks a standard purchase contract for renewables and local flexibility to offer energy financing via property taxes or in setting building energy codes. North Carolina has a Community Power score of 21 out of 36. The state has many policies encouraging local power, including net metering and above average interconnection to encourage distributed energy resources like solar, as well as requiring utility renewable energy procurement to include distributed resources. It also allows allow shared/community renewable energy and allows communities to provide financing to residential and commercial properties with property assessed clean energy. North Carolina doesn’t allow communities to pick their energy suppliers or offer a standard contract for distributed renewable energy projects or a stretch building energy code for cities to go further than the state standard. North Dakota has a Community Power score of 4 out of 36. The state has net metering and allows cities to set building energy codes, but lacks any other significant policy to support local renewable energy development. The state’s policy shortcomings include abysmal grid interconnection policies, no shared renewables (e.g. community solar), no requirements for utilities to purchase distributed renewable energy resources, no option for communities to pick their power supplier, and no choice for cities or counties to offer energy financing via property taxes. Nebraska has a Community Power score of 4 out of 36. The state has net metering, but lacks any other significant policy to support local renewable energy development, including simplified grid interconnection policies, shared renewables (e.g. community solar), requirements for utilities to purchase distributed renewable energy resources, opportunities for communities to pick their power supplier, and no choice for cities or counties to offer energy financing via property taxes. New Hampshire has a Community Power score of 18 out of 36. The state has several policies encouraging local power, including net metering allowing meter aggregation, above average grid interconnection rules, and a renewable standard requiring utility renewable energy procurement to include distributed resources. The state also allows shared renewable energy (like community solar) and lets communities to use commercial property tax bills to finance clean energy. New Hampshire lacks local flexibility to set higher building energy codes, a policy to allow communities to pick their energy supplier, or a standard purchase contract for renewables. New Jersey has a Community Power score of 25 out of 36. The state has many policies encouraging local power, including net metering (plus aggregate net metering) and above average interconnection to encourage distributed energy resources like solar, as well as requiring utility renewable energy procurement to include distributed resources. It also allows communities to pick their energy suppliers, and allows communities to provide financing to residential and commercial properties with property assessed clean energy. New Jersey doesn’t allow shared/community renewable energy or offer a standard contract for distributed renewable energy projects or a stretch building energy code for cities to go further than the state standard. New Mexico has a Community Power score of 16 out of 36. The state has several policies encouraging local power, including net metering, excellent grid interconnection rules, and a renewable standard requiring utility renewable energy procurement to include distributed resources. The state also allows communities to provide energy financing via property taxes to commercial properties. New Mexico doesn’t allow shared renewable energy (like community solar), local flexibility to set higher building energy codes, a policy to allow communities to pick their energy supplier, or a standard purchase contract for renewables. Nevada has a Community Power score of 16 out of 36. The state has several policies encouraging local power, including net metering allowing meter aggregation, above average grid interconnection rules, and a renewable standard requiring utility renewable energy procurement to include distributed resources. The state also allows communities to use commercial property tax bills to finance clean energy. Nevada lacks shared renewable energy (like community solar), local flexibility to set higher building energy codes, a policy to allow communities to pick their energy supplier, or a standard purchase contract for renewables. New York has a Community Power score of 29 out of 36. The state has many policies encouraging local power, including net metering and simplified interconnection to encourage distributed energy resources like solar, as well as requiring utility renewable energy procurement to include distributed resources. It also allows shared/community renewable energy, communities to pick their energy suppliers, and allows communities to provide financing to residential and commercial properties with property assessed clean energy. The state only lacks a standard contract for distributed renewable energy projects and a stretch building energy code for cities to go further than the state standard. Ohio has a Community Power score of 23 out of 36. The state has many policies encouraging local power, including net metering, excellent interconnection rules to encourage distributed energy resources like solar, as well as requiring utility renewable energy procurement to include distributed resources. It also allows communities to pick their energy suppliers, and allows communities to provide financing to commercial properties with property assessed clean energy. Ohio doesn’t allow shared/community renewable energy or offer a standard contract for distributed renewable energy projects or provide a stretch building energy code for cities to go further than the state standard. Oklahoma has a Community Power score of 7 out of 36. The state’s limited rules include net metering and allowing cities to provide energy financing to commercial properties via property taxes. The state has abysmal interconnection rules for distributed energy like rooftop solar, and lacks many other good local power rules. The state doesn’t have a renewable standard requiring utility renewable energy procurement to include distributed resources, or laws letting cities pick their energy suppliers, or rules allowing shared/community renewables. Oklahoma also lacks a standard purchase contract for renewables or local flexibility to set building energy codes. Oregon has a Community Power score of 24 out of 36. The state has several policies encouraging local power, including net metering with meter aggregation, excellent interconnection rules for distributed energy like rooftop solar, a renewable standard requiring utility renewable energy procurement to include distributed resources, and a shared renewables (community solar) program. It also allows communities to provide financing to commercial properties with property assessed clean energy and to set a stretch building energy code above the state standard. Oregon lacks community choice energy that allows communities to choose their energy supplier or a standard purchase contract for renewables. Pennsylvania has a Community Power score of 13 out of 36. The state has a few policies encouraging local power, including net metering, above average interconnection rules for distributed energy like rooftop solar, and a renewable standard requiring utility renewable energy procurement to include distributed resources. It lacks a shared renewables (community solar) program or provisions allowing communities to provide energy financing via property taxes. Pennsylvania also lacks community choice energy that allows communities to choose their energy supplier, a standard purchase contract for renewables, or local flexibility in setting building energy codes. Rhode Island has a Community Power score of 22 out of 36. The state has several policies encouraging local power, starting with net metering and above average interconnection to encourage distributed energy resources like solar. The state also allows communities to pick their energy suppliers, allows shared renewables (like community solar), and allows communities to provide financing to residential and commercial properties with property assessed clean energy. Rhode Island doesn’t allow require utility renewable energy procurement to include distributed resources, offer a standard contract for distributed renewable energy projects, or provide a stretch building energy code for cities to go further than the state standard. South Carolina has a Community Power score of 13 out of 36. The state has a few policies encouraging local power, including net metering, excellent grid interconnection rules, and a renewable standard requiring utility renewable energy procurement to include distributed resources. The state doesn’t allow communities to provide energy financing via property taxes, shared renewable energy (like community solar), local flexibility to set higher building energy codes, communities to pick their energy supplier, or provide a standard purchase contract for renewables. South Dakota has a Community Power score of 3 out of 36. The state allows communities to set their own building energy codes and has average grid interconnection rules, but lacks any other significant policy to support local renewable energy development, including net metering, shared renewables (e.g. community solar), simplified grid interconnection policies, requirements for utilities to purchase distributed renewable energy resources, or opportunities for communities to pick their power supplier. Tennessee has a Community Power score of 1 out of 36. The state allows communities to set their own building energy codes, but lacks nearly every other possible policy for supporting local energy action. It is one of just a few states to prohibit net metering, has significant barriers to grid interconnection, has no state renewable standard for distributed resources, doesn’t enable shared/community renewable energy, and doesn’t allow communities to choose their energy supplier. It also lacks a standard contract for distributed energy resources and doesn’t allow communities to provide energy financing to commercial properties with property assessed clean energy. Texas has a Community Power score of 5 out of 36. The state allows communities to provide energy financing to residential and commercial properties with property assessed clean energy, but lacks any other significant policy to support local renewable energy development, including net metering, shared renewables (e.g. community solar), simplified grid interconnection policies, requirements for utilities to purchase distributed renewable energy resources, or opportunities for communities to pick their power supplier. Utah has a Community Power score of 12 out of 36. The state has a few policies encouraging local power, including net metering, excellent grid interconnection rules, and it allows communities to provide energy financing to commercial properties with property assessed clean energy. Utah lacks other significant policies to support local renewable energy development, including shared renewables (e.g. community solar), requirements for utilities to purchase distributed renewable energy resources, opportunities for communities to pick their power supplier, or local flexibility to set higher building energy codes. Vermont has a Community Power score of 21 out of 36. The state has several policies encouraging local power, including net metering, above average grid interconnection rules, a renewable standard requiring utility renewable energy procurement to include distributed resources, shared renewable energy (like community solar), a standard offer contract for distributed renewable energy, and it allows communities to use commercial property tax bills to finance clean energy. Vermont lacks local flexibility to set higher building energy codes or a policy to allow communities to pick their energy supplier. Virginia has a Community Power score of 15 out of 36. The state has a few policies encouraging local power, including net metering allowing meter aggregation, excellent grid interconnection rules, shared renewables (e.g. community solar), and it allows communities to provide energy financing to commercial properties with property assessed clean energy. Virginia lacks other significant policies to support local renewable energy development, including requirements for utilities to purchase distributed renewable energy resources, opportunities for communities to pick their power supplier, a standard offer contract for distributed renewable energy, or local flexibility to set higher building energy codes. Washington has a Community Power score of 16 out of 36. The state has a few policies encouraging local power, including net metering allowing meter aggregation, above average grid interconnection rules, a renewable standard requiring utility renewable energy procurement to include distributed resources, and a standard offer contract for distributed renewable energy. Washington lacks shared renewables (e.g. community solar), permission for communities to provide energy financing to properties with property assessed clean energy, opportunities for communities to pick their power supplier, or local flexibility to set higher building energy codes. West Virginia has a Community Power score of 8 out of 36. The state has just two policies encouraging local power, including net metering allowing meter aggregation, and above average grid interconnection rules. The state lacks lacks a renewable standard requiring utility renewable energy procurement to include distributed resources, shared renewable energy (like community solar), the option for communities to pick their energy supplier or to offer energy financing via property taxes, local flexibility to set higher building energy codes, and a standard purchase contract for renewables. Wisconsin has a Community Power score of 8 out of 36. The state has just two policies encouraging local power, including net metering and permission for communities to offer energy financing to commercial entities via property taxes. The state has below average grid interconnection rules, and lacks a renewable standard requiring utility renewable energy procurement to include distributed resources, shared renewable energy (like community solar), the option for communities to pick their energy supplier, local flexibility to set higher building energy codes, and a standard purchase contract for renewables. Wyoming has a Community Power score of 9 out of 36. The state has a few policies encouraging local power, including net metering, permission for communities to offer energy financing to commercial entities via property taxes, and local flexibility in setting building energy codes. Wyoming has abysmal grid interconnection rules and it lacks a renewable standard requiring utility renewable energy procurement to include distributed resources, shared renewable energy (like community solar), the option for communities to pick their energy supplier, or a standard purchase contract for distributed renewables. 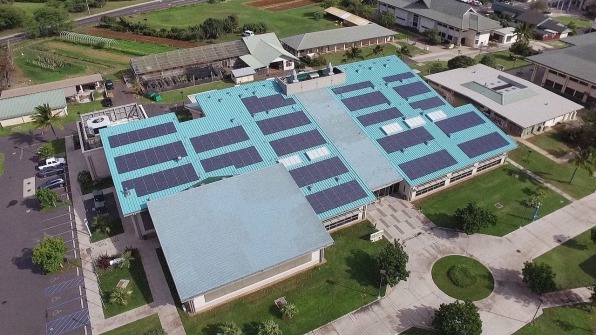 After a long process of implementing energy-efficiency measures and installing solar arrays and battery storage, Maui College is ready to cut ties with fossil fuels forever. Johnson Controls, a multinational tech and energy company, designed the solar array, which covers the whole campus, and will enable Maui College to completely eradicate fossil-fuel-based energy when it becomes operational in 2019. The path to this point, though, began in the 1980s, when Michael Unebasami, now an associate vice president at UH, was serving as the director of admin services at Leeward Community College in Honolulu (2018 is Unebasami’s 50th year in the UH system). An energy company approached the University of Hawaii with a pitch to do performance contracting for the network of campuses. Performance contracting is an approach to energy efficiency in which an energy service company partners with a building to both implement energy-efficiency measures (like reducing water usage and optimizing lighting) and converting from fossil fuels to renewable energy. The energy company pays for the upgrades but also gets paid from the cost savings that come from being more efficient. Unebasami was intrigued, he tells Fast Company, “but at the time, the university and the state were not ready to enter into that kind of arrangement.” So the idea was tabled, but Unebasami kept it in the back of his mind as he moved up the ranks of the UH system. Which was likely to the entire university’s benefit: By waiting several decades to implement energy-efficiency measures, UH has been able to benefit from the massive advancements in solar energy and storage that have occurred in the intervening years. And in that time frame, the state of Hawaii had gotten on board the idea of performance contracting, and released a statute in 2010 mandating that government agencies contract with energy companies to implement energy-efficiency retrofitting measures. Shortly after the state issued that statute, it put out a solicitation for energy companies to apply to do performance contracting for government agencies. At UH, Unebasami bought into that list to access qualified companies who could do work for the university–now that the state had embraced performance contracting, the UH system had the go-ahead. Unebasami’s director of facilities was getting ready to retire that year, but when Unebasami told him of his plan, he postponed his retirement so he could assist on the project. “He got really enthused about it,” Unebasami says. 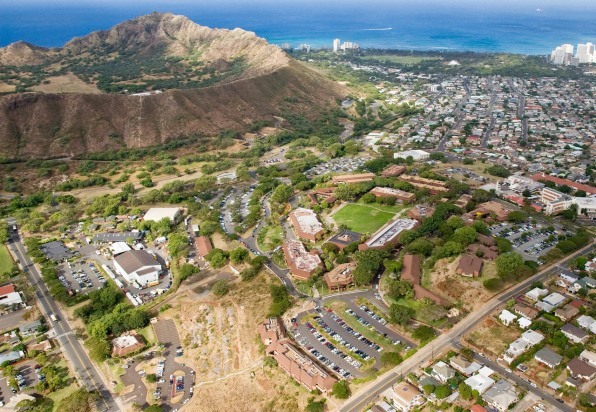 The University of Hawaii campuses were, at the time, facing a backlog of deferred maintenance projects, many of which included repairs to their heating and cooling systems. “Many of our buildings are very old and needed upgrades,” Unebasami says. By entering into a performance contracting agreement, they could tackle those needed upgrades–while going far beyond them. Johnson Controls’ proposal for performance contracting at the UH system won out, and the company got to work in 2010, first conducting audits of the university’s campuses and implementing energy-efficiency measures. During phase two of the project, which began several years ago, Johnson Controls built out and installed an array of on-site solar panels in the form of shade canopies and rooftop installations, and connected them up to batteries, which will be able to store enough energy to power the entirety of Maui College’s campus on solar; other community colleges within the system will see reductions in fossil-fuel energy use from 70% to 98%. While the new energy efficiency measures and solar arrays will save the UH system around $78 million, that’s not what makes it unique: Johnson Controls and UH have also partnered on an educational program, featuring curriculum, an internship program, and workshops for faculty and students, that will roll out alongside the new energy systems. “Typically, these performance contracts are strictly construction, but we’re a community college,” Unebasami says. It’s a surprising fact: the #1 material in electric car batteries is… graphite? Graphite is in everything from your computer… to your cell phone… to the hundreds of other electronic devices in your home. And the electric car market is growing so fast that it’s eating up the entire world’s supply. Demand is soaring — and graphite producers are seeing record profits. Especially now that two Tesla executives have left to build a battery Gigafactory of their own, further straining global graphite supplies. This unexpected material is at the center of the electric car boom… let me explain why it can make you at least 826% in the weeks ahead. The Department of Energy on Monday announced a request for proposals (RFP) worth up to $1.8 billion for two new exascale supercomputing facilities that officials say could advance machine learning and artificial intelligence capabilities across a number of industries. The RFP offers funding for two new exascale facilities at the agency’s Lawrence Livermore and Oak Ridge laboratories, as well as potential upgrades to an project already underway at Argonne National Laboratory. The systems would be delivered between 2021 and 2023. Faster processing times achieved by the computers could help assist utilities with automating management of distributed resources and enhance the output of renewable generation and storage, DOE Undersecretary Paul Dabbar told Utility Dive. Exascale computing facilities represent the “next wave” of ultra-fast supercomputers, Dabbar said, capable of processing information 50 to 100 times faster than current systems. That speed could advance data analysis and modeling capabilities across a number of industries. At utilities, the new computing power could help make sense of the deluge of data delivered by distributed resources like rooftop solar and electric vehicles, Dabbar said, as well as assist in planning infrastructure upgrades. “Utilities do a pretty good job of understanding how to model the requirements of transmission systems because there’s not many of them,” he said. “However when you go down to the house level for distribution lines, the modeling requirements for that are vastly more complicated. DOE officials told Congress in January exascale computing would be a “main priority” for the agency in 2018, spurred by new competiton from overseas. China currently has the most supercomputers on the Top500, a list that ranks high-performance computers on speed, including the two fastest computers. Officials there say they will have an exascale project online by 2020, while Japan and the European Union have their own projects underway. DOE last summer selected six technology vendors to receive $258 million through its PathForward program to deliver the Aurora exascale facility at the Argonne National Lab by 2021. The new RFP looks to build on that project, Dabbar said, but will aim to include new suppliers to give “additional diversity and flexibility” in exascale technology. To keep electricity flowing at affordable prices, South Carolina faces difficult choices about its debt-burdened electric utilities. Public power utility Santee Cooper and South Carolina Electric and Gas (SCE&G), the state’s dominant investor-owned electric utility (IOU), have a combined obligation of more than $13 billion. It was incurred when the expected $9.8 billion cost to jointly finance two new units at the V.C. Summer nuclear facility ballooned to more than $20 billion and the project had to be abandoned. There are five choices for Santee and six for SCE&G, according to new papers. Among the choices, both utilities could attempt to meet their debt by economizing, but the debt is too large for that approach to be effective. They could pass the obligation to customers or taxpayers, but many of the lawmakers responsible for the ultimate decision on the utilities’ fates have declared it unacceptable to shift the financial burden to those who did not create it. The dilemma is complicated by the fact that the utilities’ decision to expand the nuclear facility was made in good faith during the “nuclear renaissance” of the early 2000s. Many in South Carolina (SC) believed it was the right decision. But it was a wrong decision and now somebody must take “a haircut” — a financial world euphemism for a loss. The Bates White analysis found that removing the $445 million per year being charged to SCE&G customers to protect shareholder dividends would reduce rates 18%. But eliminating shareholder dividends could cause a stock sell-off. The analysis concluded a 13% rate cut would protect dividends enough to prevent the sell-off. The legislature just mandated that rate cut until a long-term solution is found. Institute for Energy and the Environment’s Cooper agreed it is criminal for both utilities to recover costs through rates, but said it is misguided to assume the utilities can be sold. “No private entity will buy them unless somebody takes a haircut,” he said. Weekley neglected to mention that the initial $1,000 per customer rebate would be followed by rate increases totaling $3.8 billion, beginning after 2020 and lasting two decades, according to regulatory filings reported by SC’s Post and Courier newspaper. State regulators this week approved the Illinois Power Agency’s long-termrenewables procurement plan, including making changes hailed byrenewables advocates to broader the program. Among the changes, the Illinois Commerce Commission included language to ensure that projects within the boundaries of municipally-owned utilities and rural electric cooperatives in the state will be able to participate in programs under the plan. The procurement plan implements 2016 legislation targeting 25% renewables. The Future Energy Jobs Act included support for Exelon nuclear plants, expanded the state’s energy efficiency programs and made changes to the state’s renewable portfolio standard. The power authority is expected to update the plan in 2019. The ICC made several changes to an administrative law judge’s proposed order approving the renewables plan, aimed at ensuring broad participation in the program. The changes specify that projects within the boundaries of municipally-owned utilities and rural electric cooperatives in the state, largely in Central and Southern Illinois, will be able to participate in programs under the Plan. The changes ensure cooperative and municipal customers can take part. Commonwealth Edison had argued that customers of those utilities should not participate in the solar renewable energy credits program. The plan lays out how the Illinois Power Authority will implement a variety of programs and procurements to purchase Renewable Energy Credits (RECs), and includes the Illinois Solar for All Program which aims to provide a solar market for low-income households and communities. The plan also includes auditing procedures to ensure Illinois residents benefit from the plan; provisions to maximize Illinois’ benefit from the clean energy economy; and eliminates all spot REC procurements to increase investment in new renewable resources that will help meet Illinois’ long-term renewable energy goals. expected to occur this summer. Solar procurements under the plan will take place after an program administrator is hired. In Hollywood big stars can sell a movie by themselves and Hollywood’s utility wants to know if renewables are ready for stardom. In 2016, the Los Angeles City Council asked the Los Angeles Department of Water and Power (LADWP) to study the possibility of moving to a 100% renewables resource mix. For renewables, this could be what Hollywood calls a “marquee moment.” Many see in renewables the ‘star’ quality to run the ‘show’ on their own. Others worry that co-stars, in the form of backup fossil generation, will be needed into the 2040s if LADWP is to guarantee reliable electricity for its 1.5 million-plus customers. That’s because if renewables get casted, LADWP faces a big challenge: Limits on regional transmission constrain LA’s renewables choices largely to solar and more solar. To answer the questions raised by the city council’s order, LADWP formed a high-powered advisory group that is winning rave reviews from renewables advocates. It includes technical experts, commercial and industrial customers, policymakers and community interest groups, according to LADWP. It is led by National Renewable Energy Laboratory researchers. The group has begun familiarizing itself with the details of LADWP operations. Its conclusions are due by the fall of 2019. In the meantime, to create a “roadmap” to 100% renewables and help inform the debate, local advocacy group Food & Water Watch (FWW) commissioned “Clean Energy for Los Angeles”, released March 7 by Synapse Energy Economics. The Synapse paper has been welcomed by advocates for a more rapid transition to 100% renewables. It found the city’s transition to 100% renewables by 2030 is “feasible” and “will be cheaper for LADWP ratepayers” than business as usual, according to FWW Executive Director Wenonah Hauter. Synapse also offers new co-stars for renewables. Instead of fossil fuels and hydropower delivered on costly new transmission, the co-stars can be energy efficiency, demand response and battery energy storage, Synapse says. Synapse associate and paper co-author Spencer Fields said the study has one very important takeaway. The biggest change for LADWP in the coming transition will not be its resource mix. It is already more than 30% renewables and quickly adding more to meet its clean energy mandates. The biggest change in moving to 100% by 2030 will be how the utility operates its system. The Los Angeles basin is a transmission-constrained load pocket. The bulk of LADWP’s 4,000 MW to 6,000 MW load is met by out-of-basin nuclear, coal and hydropower generation delivered through four transmission lines. When demand spikes beyond the carrying capacity of that limited transmission, the utility calls on three in-basin natural gas plants. The basin’s Harbor, Haynes and Scattergood plants have allowed LADWP to maintain reliable delivery of electricity. But their water-cooling systems harm the local ocean environment. And they cannot ramp generation up quickly to meet recently increasing demand fluctuations caused by higher renewables penetrations on LADWP’s system. In a preliminary clean energy future summary paper prepared by LADWP, the first “key” consideration explicitly raises the utility’s concern with maintaining system reliability without flexible natural gas plants. The rest of the paper’s key considerations implicitly raise similar concerns. One of those concerns is about meeting federally mandated reliability standards while expanding renewables. Another is that new transmission expenditures can only be avoided with more storage but relying on battery storage for reliability could be difficult with current battery costs and chemistries. Either way, there is a concern about how the transition to 100% renewables could impact rates. 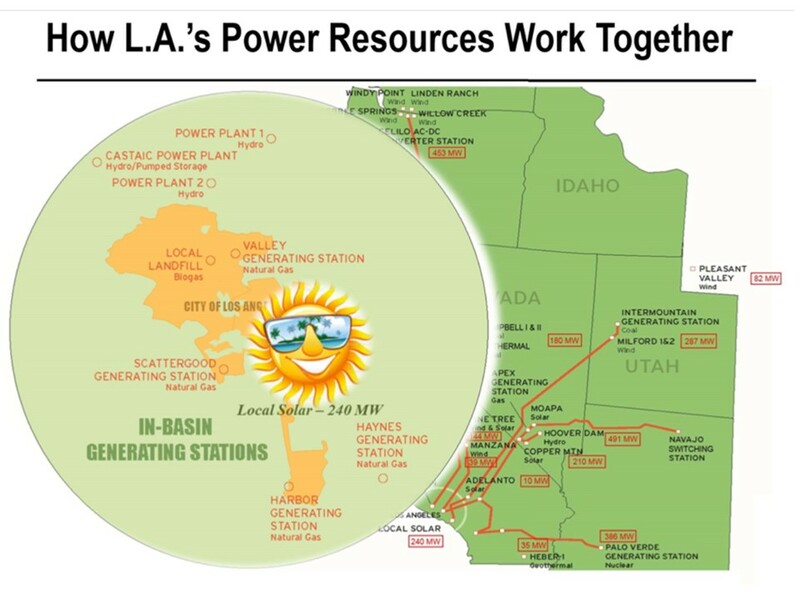 Southern California Edison (SCE) serves just over 5 million customers in regions adjacent to LADWP’s territory. It has similar concerns about a 100% renewables mix in the transmission-constrained basin. SCE spokesperson Robert Laffoon Villegas declined to comment directly on its neighbor utility’s 100% target. But SCE continues to oppose Senate Bill 100, which would increase California’s renewables mandate to 60% by 2030 and target 100% by 2045, he said. SCE’s concern is that the bill does not adequately “consider the potential impacts to utility customers and system reliability,” it wrote to regulators. Both solar cases would result in “significant curtailment of renewables,” Synapse notes. Tha’s because without new transmission, there would be limits on selling LA’s excess renewables generation into other markets. 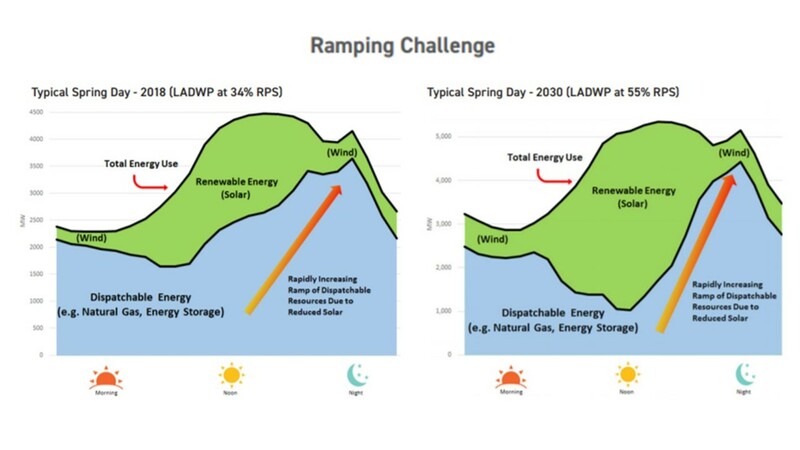 As the renewables penetration rises on its system and solar dominates midday generation, it’s anticipated that LADWP will be forced to respond to more dynamic fluctuations. In the reference case, it will have natural gas peakers for balancing and will continue to use traditional resources to meet its evening peak, Fields said. Synapse’s 100% cases use a resource mix that is “heavier on curtailment and storage,” than other potential resource mixes but there are “many potential generation and capacity mixes,” it acknowledges. The Rev. Leo Woodberry speaks at a rally in Columbia for clean energy. FLORENCE, S.C. – A group based in Florence, the New Alpha Community Development Corporation, was one of the main organizers for a recent rally in Columbia to promote legislation for clean energy. The Rev. Leo Woodberry, pastor of Kingdom Living Temple, is executive director of the corporation. Woodberry’s group of approximately 35 people joined the Sierra Club and the Dogwood Alliance as hosts of the rally. “In light of the failed V.C. Summer Nuclear Plant, we have an opportunity to recalculate how we generate energy in a just and equitable manner for our state and for future generations,” Woodberry said. More than 100 South Carolinans participated in the event, including representatives from several of the state’s environmental justice and religious groups as well as conservation and clean energy advocates. The South Carolina legislature is considering bills that would expand access to clean energy like solar, while protecting consumers across the state from costly energy such as the burden of paying for the failed V.C. Summer nuclear plant. The coalition is urging state elected officials to support the package of legislation. The number of U.S. homeowners putting solar panels on their roofs declined last year after leading installers including Tesla Inc. abandoned aggressive sales practices that had helped drive breakneck growth. Residential solar had been on a tear, averaging 49% annual growth between 2010 and 2016, but the number of megawatts added last year dropped by 16% compared with the year before, according to new data from GTM Research, a firm that tracks renewable energy. It was the first annual decline since at least 2000, which is as far back as GTM tracks figures. Industry executives and energy experts said the slowdown was driven by a sharp retreat by national solar installers, including Tesla’s SolarCity and Vivint Solar Inc. VSLR +4.45% Those big outfits had deployed large sales forces to pitch homeowners on the benefits of rooftop solar, and heavily marketed deals to lease panels that required little to no money down. The race to build a dominant national solar brand led companies to burn through cash. Unable to maintain that pace, companies scaled back and focused on profits over growth, or in some cases, got out of the rooftop solar business altogether. SolarCity, purchased by Tesla in 2016, posted the largest declines. Once the clear-cut leader among solar installers, with one-third of the national market two years ago, it ended door-to-door sales last year and cut customer-acquisition spending. Its sales, as measured by megawatts deployed, fell by 38% in 2017, according to company figures, which include both residential and commercial installations. Other companies also retreated from heavily marketing their home solar businesses, including NRG Energy Inc., NRG -0.07% which shut its business last year, and Vivint, which posted a 17% drop in residential sales volume in 2017 as it moved to prioritize profitability. Sungevity Inc. filed for bankruptcy protection last year after an aggressive growth strategy resulted in too much debt, the company said in a court filing. The industry’s sales strategies have attracted scrutiny by regulators in some states, including New Mexico, where the state attorney general, Hector Balderas, filed a lawsuit last month claiming that Vivint used “false, misleading and fraudulent statements” to sign customers up for long-term deals. Rob Kain, Vivint’s vice president of investor relations, said the company disagrees with the allegations and plans to contest them in court. “Could we have had a salesperson who was aggressive? I wouldn’t be surprised,” Mr. Kain said, adding that the company would have fired a salesperson for misrepresentations. SolarCity grew with help from a hard-charging sales culture. Before being acquired by Tesla, the company, which was run by Lyndon Rive, the cousin of Tesla founder Elon Musk, tapped salespeople from the mortgage industry and Las Vegas casinos to sell solar panels, and gave them aggressive quotas, according to current and former managers and employees interviewed by The Wall Street Journal. Last year, Tesla changed course and began selling solar panels through the same stores that sell its cars. Other sales approaches were shut down in order to “focus on projects with better margins,” the company said.Eric White, president and chief executive of Dividend Finance , a San Francisco-based company that provides loans to homeowners putting solar on their roofs, said many solar companies acted too much like Silicon Valley firms, pursuing growth at all costs in hopes of becoming leaders in a nascent market. Mr. White said that while the industry’s prior growth is “not sustainable and leaves bodies in its tracks,” 5%-to-15% annual increases are achievable.Solar energy grew rapidly in recent years as the cost of solar panels declined. The all-in cost of a typical rooftop solar system fell by 61% between 2010 and 2017 to $2.80 per watt, or roughly $16,000 for the average home system, according to the federal government. Solar executives and industry analysts believe annual residential solar growth will resume in 2018. But two developments risk hurting sales in coming years, say industry analysts. First, new Trump administration tariffs on imported solar modules, mostly from China, are expected to marginally raise costs. Second, a federal government tax incentive to homeowners worth 30% of the value of the solar array is set to end by 2021. —Kirsten Grind contributed to this article. The utility company filed its “Electrification of Transportation Strategic Roadmap” with the state’s Public Utilities Commission, outlining how it will utilize growing EV adoption to lower system costs, bring more rooftop solar onto the grid and ultimately help meet the state’s 100% renewables goal. Hawaii trails only California in electric vehicle adoption, and expects the island’s electrification of the transportation sector to result in a majority of light duty vehicles being powered by solar, wind, biofuels, geothermal and other renewable resources. Electric vehicle adoption will drive higher demand in Hawaii and across the United States, but utility officials say the trend may be key to reaching the state’s all-green energy goals. Hawaii has at times struggled to bring rooftop solar onto its system, as customer enthusiasm for panels outstripped the grid’s capabilities. But in the plan filed Thursday with the PUC, HECO officials say charging cars, trucks, buses and heavy equipment will help to integrate nearly 200,000 new private rooftop solar systems, along with grid-scale renewable projects. The utility in a statement said its plan “foresees Hawaii in 2045 with most personal light duty vehicles” powered by renewable energy. And in route to that tipping point, officials say the transition can help bring lower costs to all customers of Hawaiian Electric, Maui Electric and Hawaii Electric Light. HECO will partner with third-party providers to build out the state’s charging network, with a particular focus on charging at workplaces and multi-unit residences. HECO also wants to expand the network of utility-owned fast-chargers and public Level 2 chargers. The plan also calls for creation of “grid service opportunities” which include demand response incentives to shift vehicle charging to times when solar is abundant. Last year, HECO announced it would shift to time-of-use rates at the DC Fast Charging stations it operates, aiming to adjust customer use of the stations to encourage shorter use times and greater access. Over the next three years, HECO says it will develop “more advanced rates” in response to growth. For residential customers, the PUC recently approved a suite of solar and demand response programs, and the utility is exploring time-of-use, location-based and dynamic pricing.For commercial fleets, the utility says it will investigate bulk discounts for off-peak purchase of electricity at public chargers and depots. NextEra Energy Partners has reached a deal to sell its Canadian portfolio of renewable generation, as the company seeks to move the capital back into the United States to take advantage of the lower corporate tax rate. Canada Pension Plan Investment Board will pay $582 million and assume $689 million in debt, for approximately 400 MW of wind and solar generating facilities located in Ontario. President Trump’s push to lower the corporate tax rate has led several energy companies to make adjustments, including utilities lowering rates. Beginning this year, the corporate rate dropped from 35% to 21%. NextEra floated the idea of selling its Canadian assets during its January earnings call and has since moved quickly. The company says it expects the sale to close during the second quarter of this year. With the funds returned to the United States, the lower corporate tax rate will boost the funds available for distribution. NextEra CEO Jim Robo said the assets were sold at a 10-year average cash available for distribution (CAFD) yield of 6.6%. Included in the sale are six fully-contracted wind and solar assets, with an average contract life of approximately 16 years and 10-year average CAFD of $38.4 million.The sale includes four wind generating facilities totaling more than 350 MW and a pair of 20 MW solar generating facilities. The corporate tax cut will be a double-edged sword for utilities, reducing their tax burden as well as their revenue. But for customers, the benefits are more clear, evidenced by a trend of states pushing utilities to return savings to customers. Earlier this year, Florida Power & Light announced it would use federal tax savings to repair $1.3 billion in damage caused by Hurricane Irma last year and to avoid a rate increase. Regulators in Kentucky cited the lower rate in approving a smaller-than-requested rate increase for Kentucky Power Co. Virginia lawmakers rolled back a Dominion Energy rate freeze to return some funds to customers.